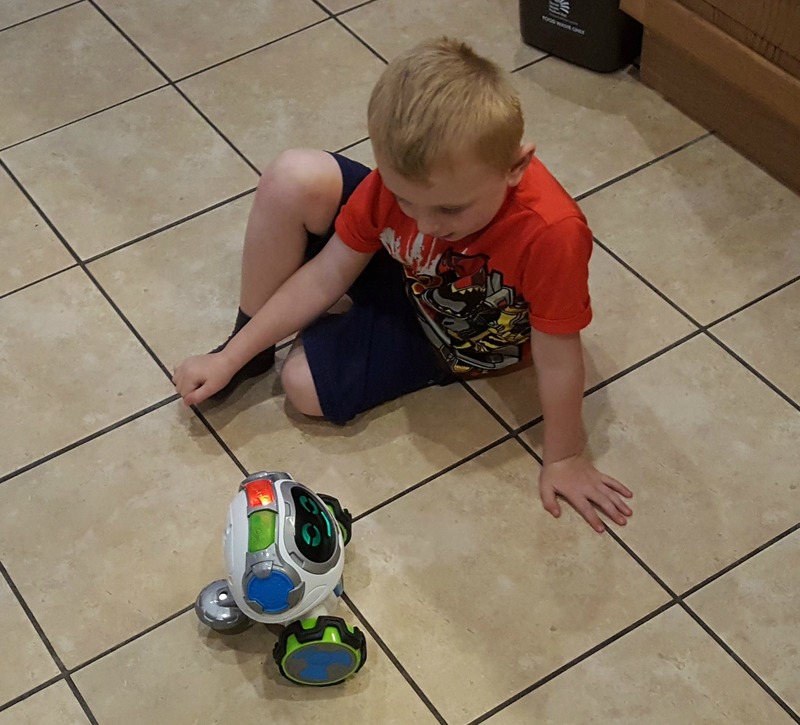 My husband has always been into gadgets and this has passed onto Elliot - he's fascinated by robots and how things work. Sometimes we get products to review that are completely up our street, and the Fisher Price Think & Learn Teach 'N Tag Movi was one of them! 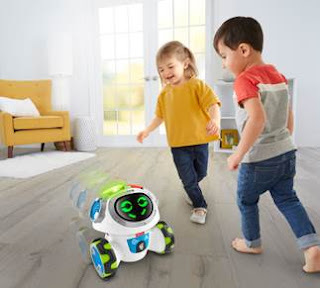 Aimed at children between 3-6 years old, Movi gets kids moving and learning along with him. On first impressions, Movi looks brilliant! He has big chunky wheels on each side, a large "face" screen (featuring over 60 different faces!) and easy to press buttons on his head and tummy. It was nice and simple to set him up - we literally just took him out of the box, clipped in the back wheel and he was good to go. Batteries are included too so he's ready to start talking straight away! The big chunky wheels mean that Movi can be used on carpets and smooth floors and he has 360 degree mobility. Alpha Fun Actions features the fantastic animal actions games where children can learn the alphabet whilst learning more about their favourite animals. Movi will say phrases such as " B, Bear! Paws up in the air! Now growl like a bear!". 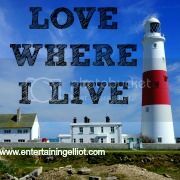 This was probably Elliot's favourite game - he especially liked slithering along the floor like a wiggling worm! Excuse the blurred shot...this worm was fast! In Think & Move Shapes, Movi will ask questions about different shapes and encourage the child to move around with him making the shape. Learn & Play features the Red Light Green Light game - just keep moving til you see the red light! All together there are 6 different games to play and the brilliant thing is, each game will encourage your child to get up and get moving whilst using their brains. Movi will help them learn important skills such as following directions and critical thinking. 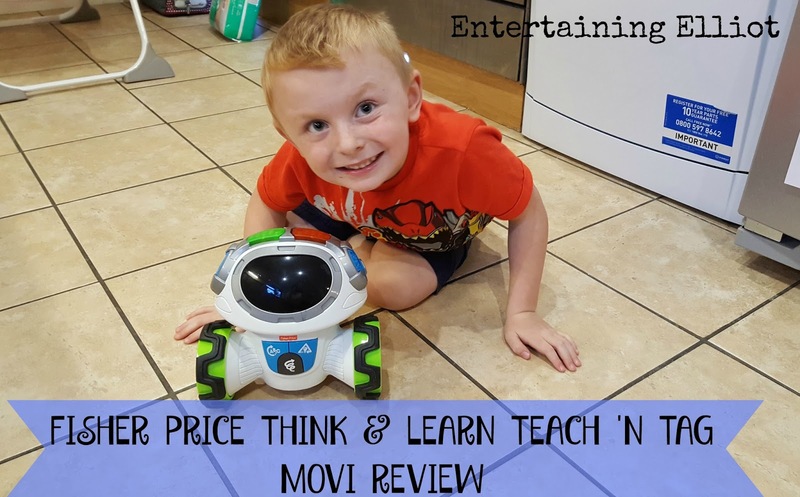 I'm all for kids getting active and I think Movi is a fab way of incorporating exercise into fun and learning. It was impossible for Elliot to stay still once Movi was switched on and he absolutely loved doing all the games and actions! 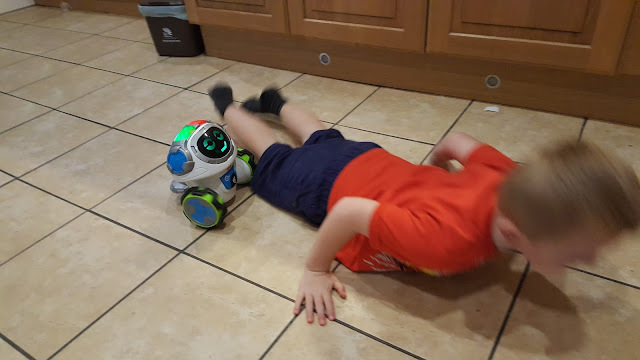 At almost, 5, Elliot is nearer the top end of the age range and while he enjoyed playing with Movi, I think the games are suited for younger children. He loved the animal games but kept asking if Movi could move any quicker! Erin (9 months) is well under the age bracket but she's crawling now and has enjoyed shuffling along behind Movi. I think as she gets older, she will be the one benefiting the most from the educational side of the robot.